It’s been speculated that Chelsea has made contact with Maurizio Sarri the manager of Italian side Napoli over the possibility of him replacing current coach Antonio Conte in the summer. Napoli manager Maurizio Sarri looks set to become the latest front-runner to replace Antonio Conte as Chelsea manager in the summer. Antonio Conte’s future at Stamford Bridge is uncertain and there have been talks of him leaving Chelsea at the end of this current campaign. He seems to have fallen out of favour with the club’s board and the relationship appears to be completely dead. To worsen matters performances on the pitch has been abysmal and no longer good enough to justify his continued employment or stay in the club. Antonio Conte looks set for the Chelsea exit door in the summer. 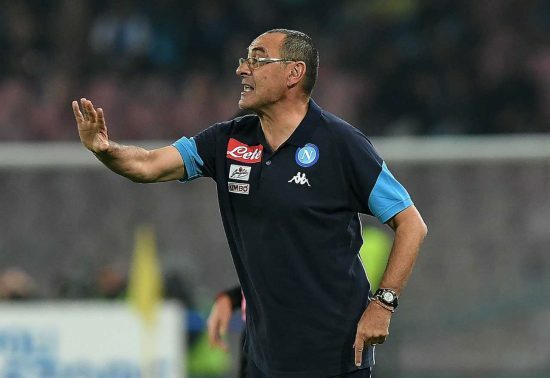 Maurizio Sarri, on the other hand, has been instrumental in transforming Napoli into a team capable of providing Juventus with some sort of challenge for the Serie A title in the past couple of years. His excellent work at the Stadio San Paolo has not gone unnoticed by Chelsea as there is the possibility of Sarri been lured to Stamford Bridge in the summer to replicate the success at Napoli. Chelsea is reportedly keen to replace Antonio Conte with Napoli boss Maurizio Sarri. The Metro report that Chelsea have made contact with Sarri over the possibility of him becoming the next manager. The Italian is thought to be ‘very intrigued’ about the prospect of working at Stamford Bridge next season. It is also reported that Maurizio Sarri has a £7M release clause in his Napoli contract which Chelsea will have to pay in full if their dream of having the Italian at the helms of affairs in Chelsea next season is to become a reality.